Our understanding of ecosystem responses to exceedingly large rare flood events is currently limited. 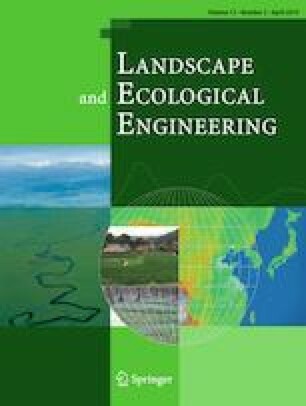 We report the resilience of aquatic community to a 100-year record-high flood, and how it varies depending on levels of water pollution, in a fourth-order gravel-bed river in northern Japan. We used data on riparian landscape structure, channel morphology, and community structure of aquatic fauna, which were collected in sites with and without effluent before (1 month–3 years) and after (10 months) the flood. Carbon and nitrogen stable isotope ratios of consumers and basal resources were measured only before (1 year) the flood. We observed aquatic food web with introduced rainbow trout (Oncorhynchus mykiss) as the top predator, with variable relative contributions of basal resources and their pathways to the rainbow trout, under the effects of water pollution. Biofilm-originating dietary carbon became the more dominant resource, with a slightly shorter food-chain length in the polluted sites. The flood led to a loss of riparian forest and a substantial increase in the proportion of exposed gravel bars (5–24%). While the average river-bed elevation changed a little, the localized scours of river bed down to > 2 m were observed with lateral shifts of channel thalweg. Despite the landscape-level physical and structural changes of ecosystem, aquatic community showed a remarkably high resilience exhibiting negligible changes in abundance, except in the polluted site where only fish abundance showed a slight decrease. This study suggests that the abundance of aquatic organisms in gravel-bed rivers is resilient to a flood of unprecedented magnitude in recent history. The online version of this article ( https://doi.org/10.1007/s11355-019-00373-y) contains supplementary material, which is available to authorized users. We are grateful to A. Agui and Obihiro Regional Office of Hokkaido Development Bureau, Ministry of Land, Infrastructure, Transport and Tourism (MLIT), for their laboratory and field assistance. MLIT kindly led and financially supported the surveys on community structure, landscape structure, and channel form. We obtained a proper sampling permit issued by the government of Hokkaido for the use of electrofishing. The handling editor and two anonymous reviewers provided a helpful comment to improve the manuscript. This study is partly supported by the research fund for the Tokachi River provided by the Ministry of Land, Infrastructure, Transport, and Tourism of Japan.